Still on privacy protection matters, today we shall be revealing to you some ways of securing your PC from physical access by an unknown user. 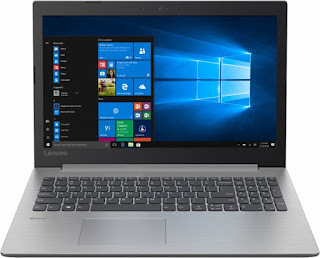 Last week on this blog, we dealt with some security tips on how to protect your PC from floating malware/viruses and other malicious content which may download itself into your PC from the internet and I mentioned about subsequently downloading of your System (PC) update and setting up a strong antivirus. But what if the bad egg you are trying to prevent from bursting into your PC is designed by a neighboring friend near you? This is why you need not to only employ cyber (internet) security but also setting up a physical privacy of your PC like what this post is talking about. Set up your PC to automatic lock when someone tries to guess your password. There could be many ways to achieve this, but this post governs two safe methods. The Command Prompts (CMD) is always there to help you communicate with your PC on what you want to be configured, and this is done by serving it some command lines. NOTE: CMD or Command Prompt window is always dark, be sure you are running Command prompt window before proceeding to the next step. Step 2. In the CMD window, type in the command “net accounts”. This command would list your current password policy of your PC. 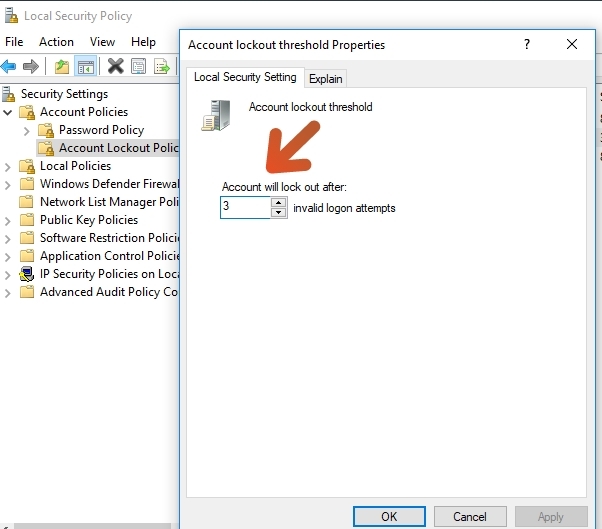 By default, the password policy is set as “lockout threshold: Never”; this implies that your user account will remain unlocked regardless of how many times you filled your password incorrectly. Step 3. 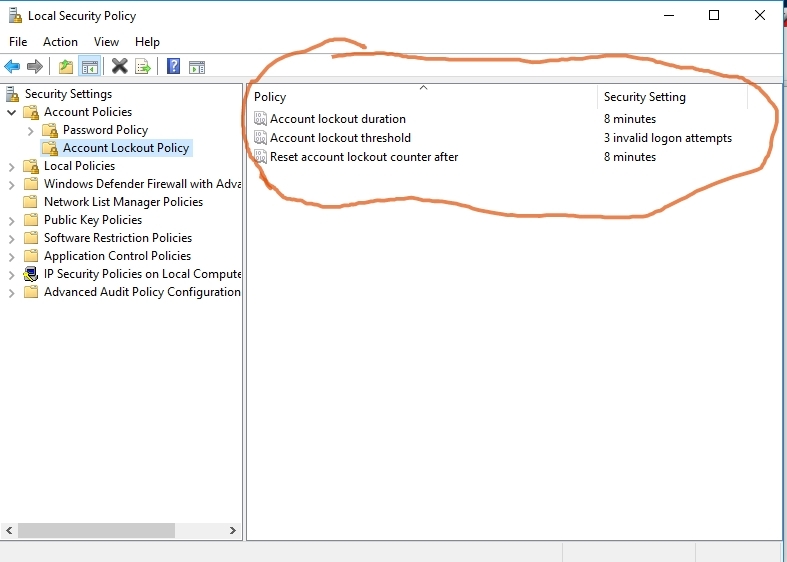 Exit the previous command prompt and relaunch (re-open) a new one and input the command “net accounts/lockout threshold:3”. 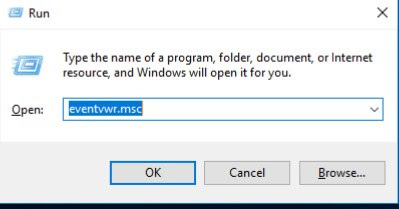 This is an example, if you input exactly the command, it would set up the incorrect password filing limit to 5 times and once it exceeds 3 failed trials, your Windows PC would be locked. Step 4. At default, the lock duration after exceeding the number of incorrect password fillings is set to 30 minutes. To change this, you should open and type in the command prompt the following command “net accounts/lockout duration:15”. This would set your PC to lock for 15 minutes after exceeding the configured number of trials. You can change the “15” in the command line to whatever number you may find comfortable. NOTE: The set time is always in minutes. 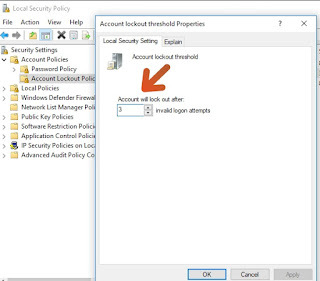 Now you are done configuring your PC to lock after a limited failed user login attempt. This would help lock out spies/unwanted users from your PC. 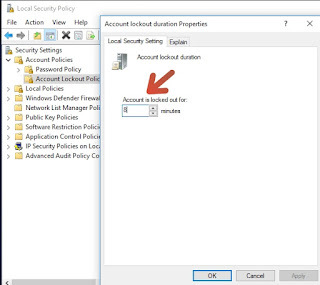 The Local Security Policy could help you accomplish the command on your PC. Follow the below steps to get it done. Step 3. 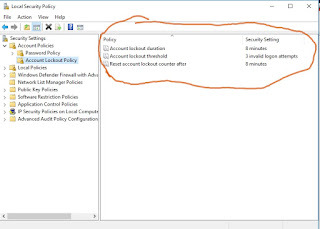 Doubleclick on “Account lockout threshold” and enter the number of invalid login attempts you wish to set and click OK. By default, the account lockout duration is set to 30 minutes, so click OK again to save the change in lockout threshold. Step 4. 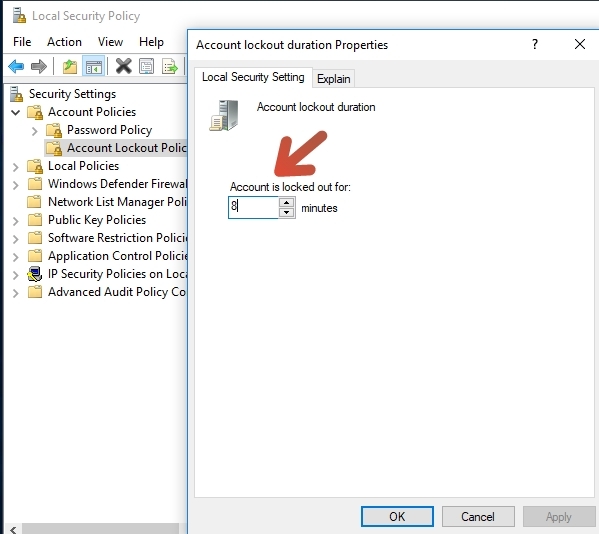 If you wish to modify the lockout duration, go back and double-click on “Account lockout duration” and modify the time. I believe this second method is much easier to execute than the Command Prompt which seems much like you are writing a program, hahaha…. Today, I'll be revealing to you the best ways of securing your PC from threats. Previously I published a similar post on how to secure your Android device from cyber attacks, but that will not be enough if you work with some security tips on your Android device and such you do not apply on your PC; its similar to not securing both devices. There's need of securing both your Android and PC devices being that you most times connect these devices to a particular network or via USB cables. However, the security tips you use on your Android device is not too different from what you should employ to your PC. I used to be very stubborn to this instruction. You should know how annoying it may be when updates keep rolling on to your PC within a short while and you are humble enough to download those updates which can never be less than 1GB. But the truth must be told, this system updates help improve your PC performance and its complexity against security threats. Downloading a system update may help fix any security flaw or bug is found in your PC or may even bring in new features to help safeguard your PC from threats like Malware/viruses/Trojans which hackers subsequently take as their tools for penetration. Input the following “eventvwr.msc” and hit Enter. 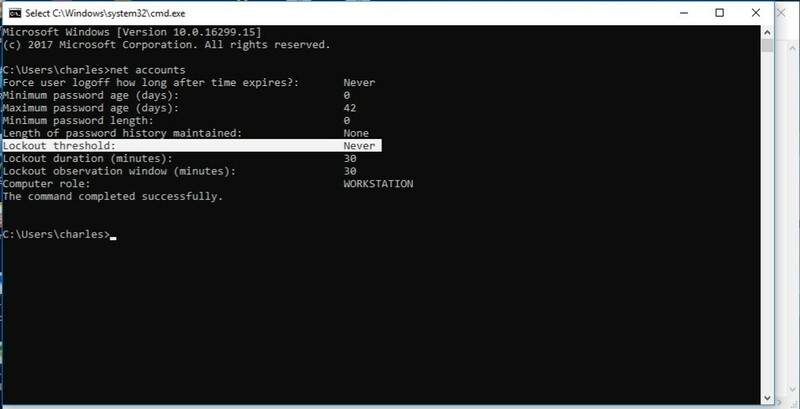 Open the System (Windows) log to view a set of currently used data with their specific date and time. This will enable you to keep track of the activities running on your PC. To get high-level security on your PC you should have at least one Antivirus software/tool installed to help you look for any security threat and action will be taken thereafter. I will always recommend Avast Antivirus and Windows Defender; these programs have helped me a lot, sorting and removing threats (hacking tools, viruses) from my Windows 10 PC. The above three tips will help you secure your PC from cyber attack. If you eventually get a new PC, we recommend you should first install/setup an Antivirus program running and updating your Windows should be your next step before thinking of connecting to the web. Have you ever thought of recovering back your lost or deleted browser history on your computer? It is very possible to perform such action but not everyone is aware of this. At the end of reading this post, you should be able to know several methods of getting back your deleted browser history. Keep reading. To achieve this, you'll have to install some tools on your PC and set it up to work for you. There's a lot you can do with CMD on your computer and one of them is retrieving your web logs or browser history. This method uses DNS Cache to restore deleted Chrome browsing history. It requires internet access on your computer and you should not shut down or restart your Computer if you need to restore deleted internet history. Here, a list containing all your previously visited websites on Chrome, Internet Explorer, FireFox, Opera, etc. will be displayed to you. But immediately you shut down or restart your Computer, all saved DNS cache will be lost. That is, you won't be able to get back all previously visited webpages. Index.dat Analyzer is one of Systenance's software developed for the purpose of accessing and making usefulness of index.dat files hidden on your computer. Index.dat files are hidden files on your computer that include all your online activity, that is, list of URL-s, files and documents you recently. These hidden files unintentionally creates potential privacy threats to the user as they can be accessed without the user's knowledge. Index.dat files exist for some reason only known to Microsoft. According to the company, these files are used to store visited websites which are then used to speed up internet explorer. However, they are hidden files that do not contain an actual web cache other than information about your browsing habits. There is no prove that these files help to speed up internet explorer, they are just hidden on your computer while they monitor and cache your browsing habit. Now back to the use of Systenance Index.dat Analyzer. Step 2. Launch the software and click on the search button. This will permit the tool to sort out all your browsing history by looking up for the index.dat files on your computer. You can also select your preferred browsing history and decide to either delete them permanently or save them. Method 3. Using Google's My Activity. This is an alternative to the above methods, though this requires an internet access as you will be logging on your Google account on the browser you frequently use. 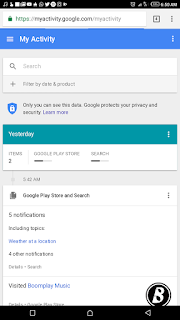 Google My Activity page could help you save videos you've watched on YouTube, websites you've visited with that browser, provided you sign in your preferred Google account on the browser..
Now how would you gain access to your deleted browser history? Step 2. Opening the page, you will see a tutorial on how to use it, skip it if you like and hereafter, your browsing history will be displayed to you. You can make use of the search box to find a specific history. We've come to the end of this post titled “ How to retrieve your deleted or lost browsing history”. Hope you found this useful? Make comments below if there's anything you want to let us know. 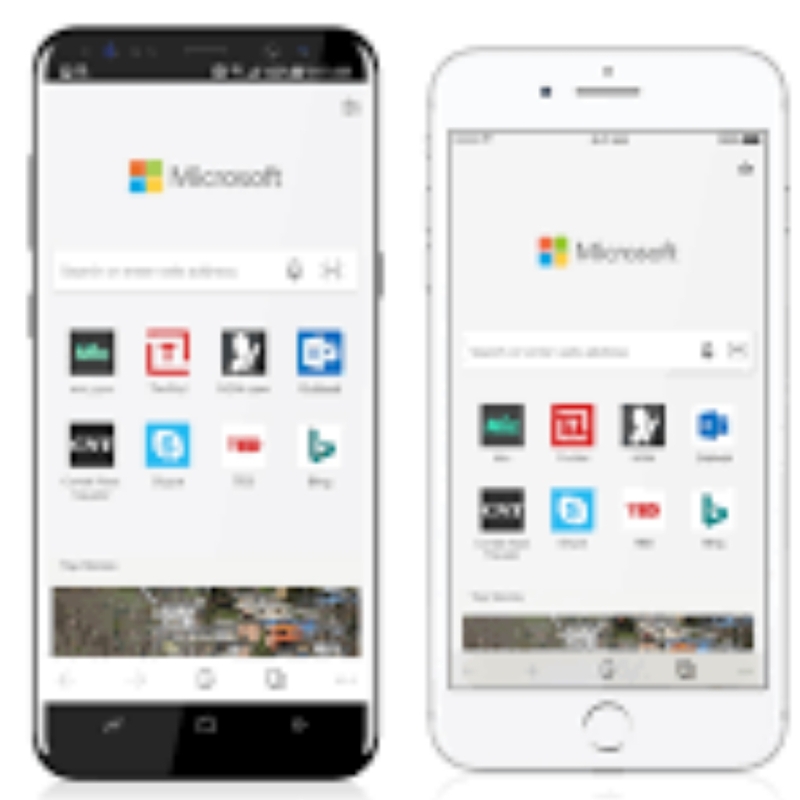 A few days back, news leaked out online that Microsoft is planning to make Microsoft Edge browser available to Android and iOS devices. If you're not too familiar with the Microsoft Edge browser, it is the successor to Internet Explorer browser and it's included in the windows 10 set as its default browser. The mobile version of the Microsoft Edge is currently available for those having the new Windows 10 Insider Preview build. Having the Edge web browser on mobile devices running on iOS and Android will build better approach and more user-friendly with the windows 10. Having the newly designed mobile version of Edge web browser on your Android/iOS devices lets you enrol the continue on PC feature, which means you can resume your activity on your phone from where you left it on your computer as it allows for synchronization between your computer and the smartphone. Apart from your search habit, your bookmarks, passwords, history, and other fill in details will also get synchronized so you can access them easily especially when they're needed. What's new on Edge mobile web browser??? The search engine: As usual the default search engine dedicated to the Edge browser is the Bing search engine. Now on the mobile version, is not only limited to Bing, also to Google’s search engine and Yahoo search engine, you can make your choice of which search engine is desired to be your default type. Too bad the Edge mobile web browser does not support ad blocking. Perhaps it should in its next version. 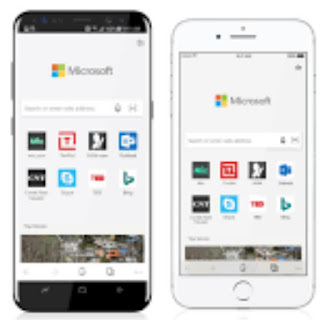 The design: Microsoft Edge mobile browser has pretty much the same design as the Chrome and Safari browsers. 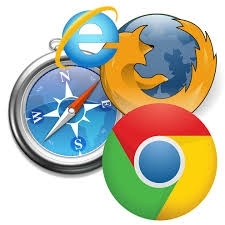 These browsers are familiar in surfaces and having features like QR-code reader, Reading View, voice search, Hub View and more. For now, Microsoft is only aiming at smartphones running on Android and iOS platforms, tablets are yet to gain support but I'm certain that as time goes by, tablets users will benefit too. 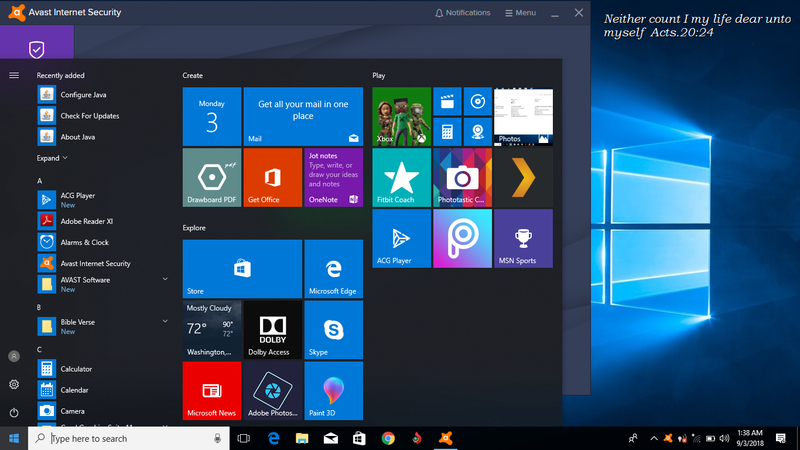 For Windows Insider users, all you have to do is visit this page and confirm it is an insider, which will prompt Microsoft to send you a message containing the instructions to install its first Edge Beta for your smartphone running on Android or iOS platform. Currently, the official app has not yet been introduced, we should be expecting it before the year-end. 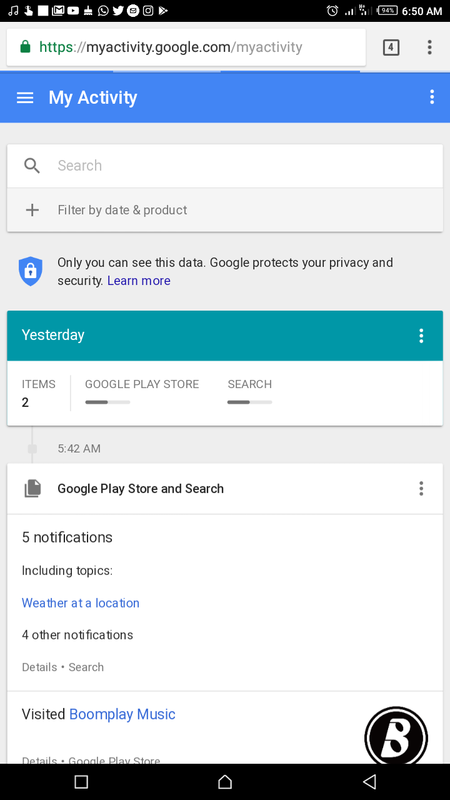 Though the preview app was recently introduced to Google Play Store for Android users. Click here to download the preview app for the meantime. So that should be all, for now, regards Microsoft Edge mobile browsers. We'll keep you updated as soon as something comes up. Thanks for visiting Oshetech, please do come back for more tech info. Tags: Microsoft, Microsoft Edge, Microsoft edge for Android, iOS Microsoft edge. Know the top four common registry cleaners you can use on your PC to ease its mode of operation. If you do browse the internet often, you may have come across certain cleanup tools claiming to be effective whereas they are not. In this post, I am going to share with you, 4 best registry cleaners that perform its work more effectively. Registry Cleaners are third-party software specifically built for the Microsoft Windows Operating System mainly for the purpose of removing needless items from the Window’s registry. With Registry cleaners, your computer can be optimized giving it a speed boost and can stop common crashes. Of course, if we do not use registry cleaners for our computer, there might likely be possibilities that the computer may become slow in performance due to a heavy workload beyond the system’s working performance. In this post, I am going to share with you, 4 best registry cleaners that perform its work more effectively. JetClean is one of my favourite registry cleaning tools. With this tool, you can be able to get rid of junk files, and even irrelevant registry entries just by a single click, and doing this will improve the performance of your PC. One unique feature of JetClean is that it requires very little space on your computer for it to function, meanwhile, it functions effectively, giving you a proper clean up of your PC. This is another useful tool used online by most PC users. 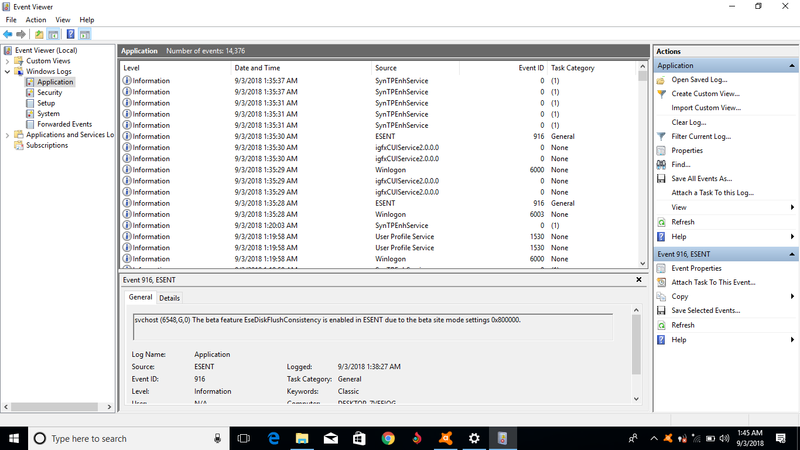 It does not only clean up junk files from your computer but also helps in fixing registry problems. 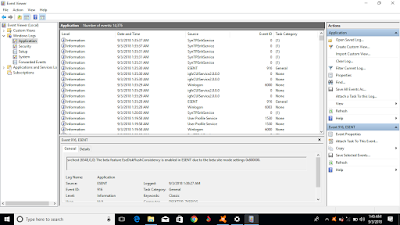 This tool is very cool to use and is user-friendly, anytime a user wants to make use of CCleaner, he/she will be asked to backup the current registry running on his/her PC before applying any changes. This will never make you lose any functionality. CCleaner does more than improving your PC performance. CCleaner ensures safe browsing on your computer, of course, advertisers will always track your behaviour using your stored cookies. CCleaner erases your browsing history and cookies for making your internet browsing and identity anonymous. This is another cool Registry-cleaning tool. Wise registry cleaner can fix windows errors, clean registry junks, and improve your PC performance giving it a better working speed, with this tool you can boost your device’s memory by ending needlessly and duplicated background apps that slow your device. It is a good thing to know that Wise Registry Cleaner not only made itself available for PC but also for Android. So you can secure and fix system issues both on your PC and Android device using Wise Registry Cleaner. Speaking of safety, Auslogics is highly recommended. This tool can wipe all invalid entries from your PC registry and return your PC to its usual healthy state. Auslogics Registry Cleaner also repair system crashes and at the end, you will have your PC running on a better performance. 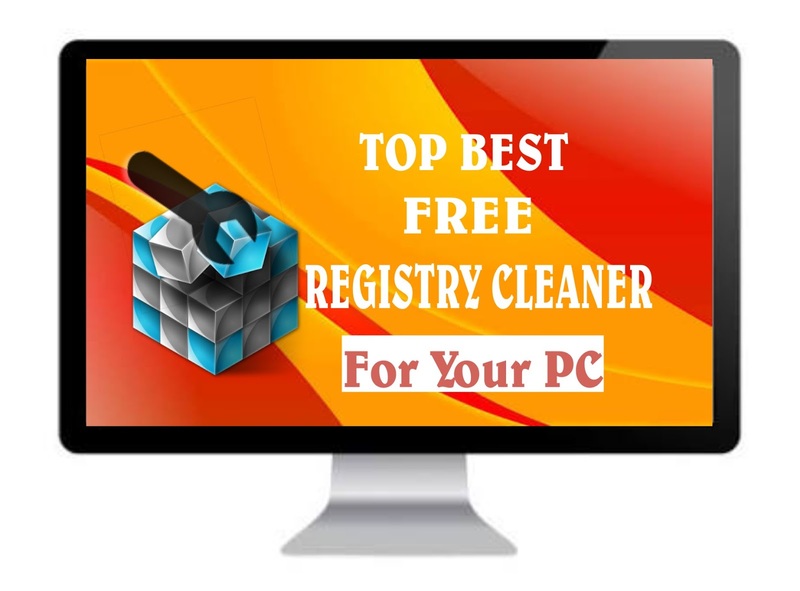 So above are the four most popular and effective Registry Cleaners to keep your PC in a good health state with a better performance.